Organized by the Tokyo Metropolitan Government, Tokyo Culture Creation Project (Tokyo Metropolitan Foundation for History and Culture) (TMFHC), the Japan Foundation and the University of Tsukuba, in co-operation with the Association for Corporate Support of the Arts (ACSA), the second Tokyo Conference was part of the comprehensive series of arts and cultural events showcased by the Tokyo Culture Creation Project. 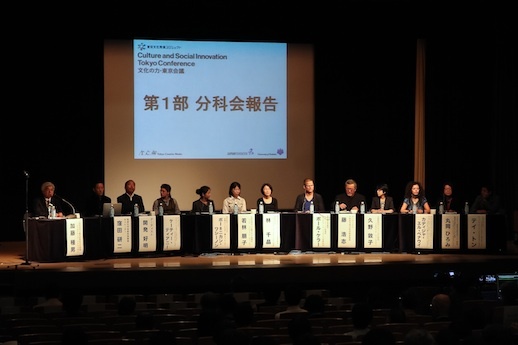 This year’s conference focused on “Culture and Social Innovation”. Extensive exchanges and several preparatory meetings among an international group of artists and cultural operators culminated in two days of fruitful and exciting discussions on October 19th and 20th. On October 20th, general moderator Taneo Kato (Executive Advisor at the TMFHC) pointed out in his introduction that the world, and Japan in particular, needs to find new means of cultural and social expression while at the same time preserving traditional culture. Participants from the sessions held the day before reported on their heated discussions, which apparently lasted several hours. Like last year’s conference, the memory of the Great East Japan Earthquake was felt in many of the subjects discussed. 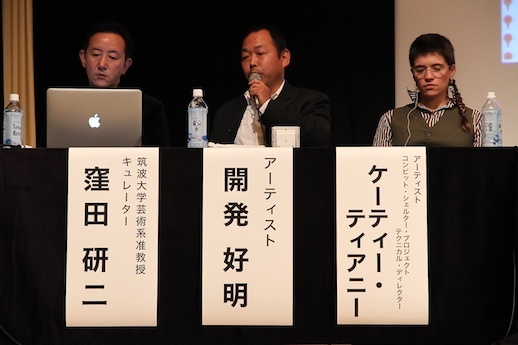 Kenji Kubota, Associate Professor at the University of Tsukuba, curator and moderator of the first session, introduced a number of worldwide cultural and artistic projects to support affected areas. Among the issues discussed: How can artists better assess the hidden needs at disaster-affected areas? How can they be more effectively engaged in society? What are the challenges they have to overcome? How to develop a network whose activities are truly sustainable? Japanese artist Yoshiaki Kaihatsu organized the Dailily Art Circus, a charity travelling exhibition and workshop in which he showed works donated by artists and sold them in order to raise money for the victims of the earthquake in Tohoku. He stressed that for the area to achieve a quick recovery, the whole country must take part in the reconstruction. American artist KT Tierney then talked about participating from 2010 in a post-earthquake reconstruction assistance project in Haiti. The ongoing project focuses on building houses and communities by using materials that are easily available in loco. It is also important that the local residents be directly involvement in the project as part of the psychological healing process. Thai curator Nikan Bow Wasinondh was among the planners of the “You Are Not Alone” exhibition and “Art for Help” project that followed her country’s Great Flood of 2011. She discussed her involvement in setting up education programs and classes for children in evacuation areas. Tomoko Wakabayashi, Senior Program Officer at the ACSA, discussed with the other panelists ways to sustain these projects. In particular, she explained how the artists can sustain their activities, and how these groups and such organizations as the successful GB Fund (The Great East Japan Earthquake Restoration Fund, ACSA) can better sustain funds, for example through tax merit systems. For Wakabayashi it is important that all the participants in such projects share information and knowhow in order to achieve lasting results. Chiaki Hayashi, Co-founder of Loftwork Inc., Project Coordinator in Culture and GLAM at the Creative Commons and moderator of the second session, reported on discussions that ranged from differences in frameworks between Japan and Europe, to the ways to promote activities worldwide based on a scheme compatible with different cultural and administrative systems. Hayashi identified three main means to activate cultural activities: 1) start small, and find out what you can really do before committing to a project; 2) create a flexible framework without prefixed parameters, and be careful to constantly check the current status of a project in order to make the necessary adjustments; 3) most importantly, identify the real needs in order to avoid mistakes and a wasteful use of resources. Hayashi believes that culture and art are our best weapons to fight prejudice and preconceptions. Artist Hiroshi Fuji, though, takes the position that we should not be deceived or beguiled by art and culture. In his contribution to the panel discussion he expanded on the importance of getting in touch with your surroundings, and how art should occur naturally while an artist explores his or her environment in a very personal style. Rather than in a planned or conscious way, what an artist does may surprise even them. It will organically influence and spread to others, and then the world as a whole, leading to social change. On the same theme of sharing and networking – the two keywords that kept showing up in everybody’s reports – Dutch Copyright Policy Adviser Paul Keller explained how a number of European cultural institutions have decided to react to Google’s book-scanning project by launching Images for the Future, one of the biggest digitization projects for audio-visual heritage. According to Keller, even when embarking in such big and long-ranging projects people should allow themselves the freedom to make mistakes. 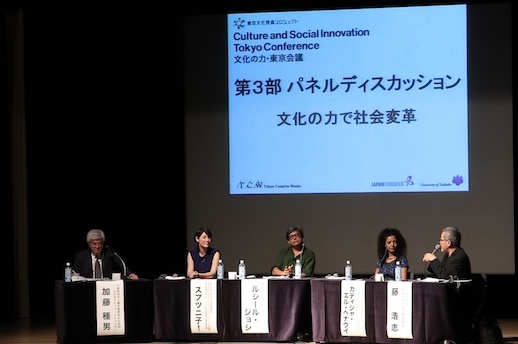 Atsuko Hisano, Program Director at the Saison Foundation and moderator of the third session, reported on discussions that mainly focused on the role of performing arts in building international understanding through networking. According to Hisano, even in the age of instant global communication through the Internet and social networks, there remains a strong need for people to meet face to face in order to better develop mature networks. In this sense, she identified “people”, “mobility” and “international connections” as the keywords for this session. This group particularly discussed how Arab and Asian regions, which provide cultural models that are quite different from the prevailing Western one, can provide ways to overcome barriers when pursuing intercultural exchanges. Moroccan cultural promoter Khadija El Bennaoui, Coordinator at the Art Moves Africa (AMA) and Consultant and Project Manager at the Young Arab Theatre Fund, reported on her activities at AMA, which supports cultural and artistic exchanges within the African continent, and holds symposia to promote dialogue among independent artists and cultural organizations in the Arab world. She talked about the very important historical phase the Arab world is currently experiencing, and pointed out that this is the moment for artists and cultural practitioners to engage socially and politically in their own countries. According to El Bennaoui, the Arab world, historically influenced by Europe, now needs to look at other emerging countries such as Brazil, India and Turkey as new models for social and cultural development. To achieve this, it is important that people from the Arab world start travelling abroad and meet people. Hiromi Maruoka, Director of the Performing Arts Meeting in Yokohama, has worked to construct an open network in her field, and she related how she felt the bonds between people in and outside of Japan through the catastrophe. Today the society, which has pursued evolution without prerequisites, is now being shaken. What is vital is to question what culture can do through the arts which exist outside society: Not just complementing the failures of politics, economics and diplomacy, but the creation of new values with flexibility and mobility, connecting to proposals for our society. For that reason the building of an internationally open network is important. Tay Tong, General Manager of TheatreWorks (one of the leading theater companies in Singapore), is one of the people behind Arts Network Asia, an organization which promotes dialogue and exchange within Asia through residencies and grants for projects. Echoing El Bennaoui, he insisted on the need for policy makers to allow people-to-people exchanges in a free space, free of any kind of prejudice and discrimination, in pursuance of art for art sake. Yoshiharu Fukuhara, Honorary Chairman at Shiseido Co., Ltd., was not able to participate, but moderator Taneo Kato summarized the content of the keynote speech he was meant to give. 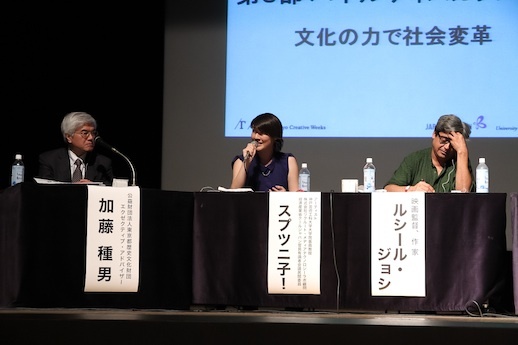 Titled “Designing Our Society through a Cultural Capital Approach”, Fukuhara’s speech pointed out how corporate activities throughout the twentieth century placed too much emphasis on the pursuit of short-term profit. According to Fukuhara, globalization seems to have become an end unto itself, and we run the risk of forgetting the cultural identity of each country. That is why the moment has come to replace the traditional goods-for-money or services-for-money process with a new approach in which “culture” becomes a new form of stock. We have finally come to realize that we cannot rely on the forces of politics and economics alone to transform our stagnant society. Culture has the power to imbue people with a sense of confidence. Therefore it is now the time to ask these important questions: What is the meaning of community? What is wealth? How are we to live? In order to build a new society, we need innovation, and people must become guardians of culture. It is exactly through this process that individuals and those same corporations can contribute to the full development of cultural power at local level. Each local center (e.g. New York, Paris, Tokyo) then can use recent technological advances to share their specific cultural capital internationally, thus contributing to a fundamental change at global level. 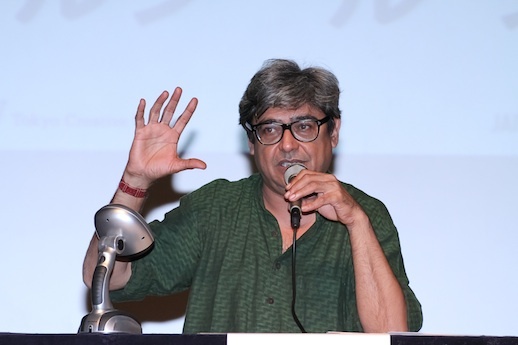 Indian film maker and writer Ruchir Joshi, meanwhile, devoted most of his keynote speech to comparing disaster response and relief in Japan and India, stressing how in his country, natural and man-made disasters (e.g. Bhopal in 1984) are not an opportunity for starting anew and giving new life to society, but generally result in more problems, exacerbating the pre-existing situation. Joshi then said that art, like animals and plants, is becoming an endangered species. Just when more and more individuals take up and are exposed to art, more people are actually cut off from their cultural traditions. On the contrary he advocated a return to art as something that nurtures society. In this respect art must get out of the galleries and go back to the public squares where it originally belonged. 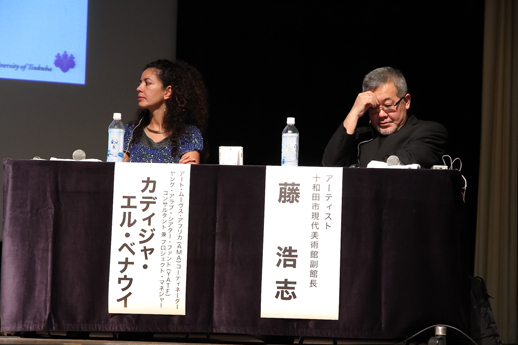 The event, which was free to attend, also concluded with a panel discussion on “Culture and Social Innovation” with Ruchir Joshi, Hiroshi Fuji, Khadija El Bennaoui, Sputniko!, and Taneo Kato as a moderator.